The following are errors that I found in the first printing of Volume 1 of Kodansha USA’s English release of the Sailor Moon manga. They are divided into sections for writing errors (presented in a table), possible issues on multiple pages, honorific issues, inconsistencies/continuity errors, and miscellaneous errors (presented as bulleted lists). (p. 29) Spelling error. Should be “brooch.” Spelled “brooch” correctly. Spelled “brooch” correctly. Awkward writing: “dummy” a bit overused and could be replaced by another word, also “You’re kidding” is used a lot and could probably be replaced with something like “No way!”. Inconsistency: In Usagi’s first transformation on p. 30, she says “Moon Prism Power! Make Up!” but on other pages the “up” part is written with extra u’s, though this may just be Usagi dragging out the vowel for emphasis. Inconsistency: Throughout Act 2, the coursework used by the Crystal Seminar is said to be on “disks,” but they’re clearly shown in the art to be CD-ROMs. It’s possible that’s it a spelling error and was meant to be “discs,” but if so, it’s a pretty pervasive spelling error. Either that or Naoko-san updated the art to be CD-ROMs in the renewal version (since in episode 8 of the anime and assumedly the original manga run, they were indeed floppy disks) but didn’t update the dialogue. As Brad/Moonkitty has pointed out, the “Haruna/Haruda” pun that appears several times in the manga, while it makes sense in the original Japanese, doesn’t make any sense in English. No explanation of the pun is given in the translation notes either. (TokyoPop instead nicknamed Haruna “Miss H”). It is strange that they left that pun in without explanation, considering they left out the “princess”/”pudding” pun (“purincesu”/”purin”) from p. 51, stating in the translation notes that the words “don’t sound all that similar in English.” (They instead attempted to create a reasonable English equivalent with “princess” and “Royal chocolate”). Page 121 and others – “Four Kings of Heaven”: Technically, the translation of the Japanese word for the Dark Kingdom generals, Shitennou, is “Four Heavenly Kings.” No explanation is given for why it’s translated “Four Kings of Heaven” in this translation. Correction: Elly has pointed out to me that the correct translation of “Shitennou” is actually “four generals,” the way it was translated in the English dub. So apparently both me and William Flanagan (the translator of the Kodansha version) are wrong. This whole volume could have benefited from an honorifics guide like the one included in Del Rey mangas. It would’ve made the honorifics that were left in make much more sense to the average reader. “Ms. Genius” (several pages in Act 2): A random use of an English honorific in a manga mostly filled with Japanese ones. Not sure what to replace it with, maybe “genius girl”? “Old-Man Hino” (p. 95): Probably Hino-ojiisan in the original. Not sure whether “Old-Man Hino” is the best translation of that, though since it is used by people who may not know Rei’s grandfather very well, it may be acceptable. “A Miko-san, huh?” (p. 103): the “-san” is not needed in English. “Sailor Moon-chan” (p. 125): “-chan” not needed really, though it may be included just to be cute (people call Sailor V “V-chan”). Starting on p. 134, also on other pages: The “Bro” issue with Motoki, already mentioned by Brad/Moonkitty. Probably Onii-san in the original, since it’s acceptable in Japanese to address an older boy whose name you don’t know as Onii-san (and the girls don’t know Motoki’s name till Act 6). After the girls learn Motoki’s name, though, the use of “Bro” is not needed (although Mako-chan uses it on page 205 after learning Motoki’s name – “the ‘bro’ at the game center”). Before that, though, I don’t know what a good translation would’ve been; I suppose they could’ve left it as Onii-san and then had a translation note to explain it. Brad/Moonkitty pointed out that the sensei in Makoto’s remark “It’s naturally wavy, Sensei” (p. 171) could just have easily been translated “sir,” but I think that since she seems to be speaking to a teacher, sensei is appropriate. Yet another example of why this volume needs an honorifics guide. “Bride-san” (p. 185): “-san” not needed. “The beautiful Miko-san” (p. 200): “-san” not needed. The previous page has an aside pointing out that the store is full of middle-aged women, so I’m not sure how the baddie’s going to get youth energy from them, unless she means energy to make her look young, since some of the youmas (as well as some of the Dark Agency idols in Sailor V) look really ugly in their true guises. Whereas on page 35 it was “Beauty and Justice.” “Guardian of Love and Justice” is the correct translation of the original, ai to seigi no senshi. Pointed out by Brad/Moonkitty. While “warrior” is an accurate translation of senshi, it is inconsistent with the word that is used for senshi throughout the manga, “guardian.” “Warrior” is used again on page 120 with Sailor Mars, called the “warrior of fire and passion.” Once Jupiter is declared on p. 194, it’s “guardian” again. Coincidentally, right after Luna calls Mercury a “warrior,” she calls her “guardian of the Sun’s nearest planet.” Hmm. The name for Sendai Hill is variously written as “Sendai-Zaka,” “Sendaizakaue,” and “Sendai-zakue” throughout Act 3. On page 86, Luna told Usagi they were meeting for a strategy meeting at Crown at 5:00. It seems odd that, if Ami knew she had juku at that time, she would’ve also agreed to meet Usagi and Luna at that time. Also, the art in this panel shows it’s actually 5:05. The word “miko” is variously written as either “miko” or “Miko” throughout Act 3, like the translator couldn’t decide whether to capitalize it or not. Coincidentially, the “Evil spirit, be gone!” translation is rather similar to the name change for “Akuryou Taisan” in the French Sailor Moon manga (published by Glénat), where it was replaced with “Vade retro, Satanas,” a common Catholic exorcism meaning “Get thee behind me, Satan” (probably taken from Jesus’s words to Peter in Matthew 16:23). This change also appeared in the Spanish manga, which was also published by Glénat and translated from the French manga. “Usagi-san” (p. 94): While this is appropriate for Rei to use since she’s just meeting Usagi (whose name she must’ve heard from Luna when Luna and Usagi were outside the shrine, or from Ami when Ami pointed Rei out to Usagi earlier; it’s not clear), later, on pages 104 and 105, Rei is suddenly calling Usagi “Usagi-chan,” with no explanation for this sudden change in address. Drunk Usagi (p. 158): Usagi fainting and her slurred speech (“Shorry…”) suggest she’s drunk, but in a translation note on page 239, “juice” (juusu) is indicated as being a word in Japanese for non-alcoholic beverages. Ami’s IQ (p. 200): Ami’s IQ was only rumored to be 300 in Act 2, but on this page it is stated by Usagi as if it were a fact. The shirt of Ami’s school uniform is dark-colored on pages 53-59, but white thereafter. Correction: An anonymous commenter pointed out that the reason Ami’s shirt looks darker is because she is wearing a sweater over her uniform. There is a picture of her wearing a similar sweater on page 6 of the Materials Collection. I had not noted this in the manga art. Thanks to whoever it was who pointed that out! Classes are over? (p. 62): Usagi says classes are over, but she appears to be in a gym class uniform. Though maybe she just came from gym class (since I don’t think she’s in any sports clubs). Misplaced footnote (p. 93): The footnote stating what’s written on Rei’s ofuda is placed under the wrong panel (though they may have done that because the panel it should be under is borderless and doesn’t leave enough room to put it there). Fire or Flame? (p. 120): Here Mars is called the “warrior of fire and passion,” but elsewhere in the Sailor Moon canon Mars is called the senshi/guardian of “flame and passion” (honoo to jounetsu no senshi). Not sure if hi (“fire”) or honoo (“flame”) is used here in the Japanese original. Tuxedo Mask Double Take (p. 124): In Luna’s profiles, Tuxedo Mask’s civilian name is given as “Mamoru Chiba,” but as far as I know, the fact that Tuxedo Mask is Mamoru is not known yet at this point (it’s revealed in Act 7 when Usagi wakes up in Mamoru’s apartment after being saved by Tuxedo Mask). Zakaue? : No explanation is given for the suffix “-zakaue” added to “Sendai” in Act 3. It’s possible that it is meant to be “-sakaue,” which is one reading for the last two kanji (坂上) used in the Japanese name for “Sendai Hill,” where Rei’s shrine is located. “Sakaue” is made up of the character for “hill/incline/slope” (saka) and the suffix ue, which means “above” or “up” and was once used as a honorific added to names, though it is now rarely used (except in cases like chichiue and hahaue, very polite ways to refer to your father and mother; one modern example of these words in use is in Japan’s version of the Hetalia: Axis Powers ending “Marukaite Chikyuu”). 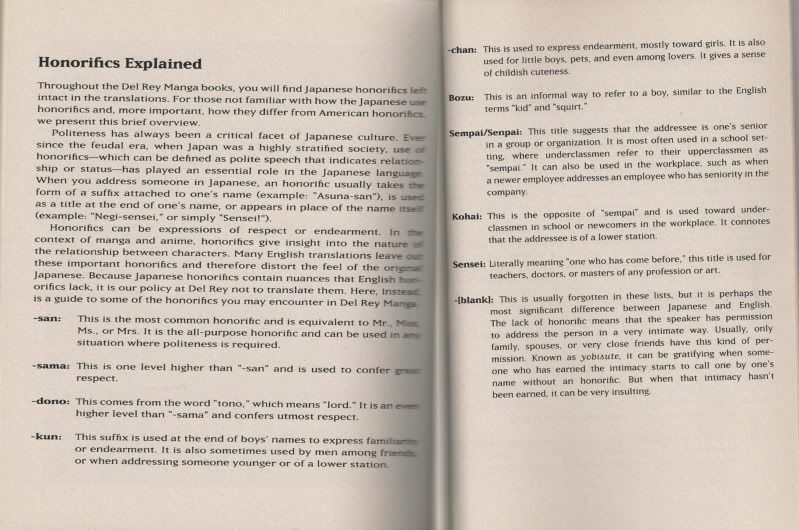 (Thanks to Denshi Jisho for the kanji meanings here, and Wikipedia’s “Japanese honorifics” article for the info on the use of “-ue” as an honorific. The Hetalia factoid I found out myself from watching it). After doing some research, I have found that “Sendaizakaue” is in fact an actual name used for an area of the Azabu-Juuban Minato district of Tokyo. (And apparently it is a really desirable neighborhood, because searching for it on Google brings up a lot of apartment listings). However, that name would mean nothing to the average reader of this manga; therefore, it would’ve probably been better to translate it “Sendai Hill,” as I believe TokyoPop chose to do, which would make more sense (and still be accurate translation-wise). Translator tour? (p. 145): When Princess D calls over her translator, she says she needs help from said translator because she “still [doesn’t] quite understand the layout of the embassy.” How would a translator be able to help the Princess find her way around the embassy? Unless the translator works there or something (and of course, we find out later that the translator’s a youma, or possessed by one at least). Groom at the Fitting? (p. 170): One of Usagi and Naru’s friends says to Naru, “I see, so that’s why you went to the fitting instead, huh?”, after hearing that Naru’s cousin’s fiancé disappeared. However, grooms do not usually go to bridal dress fittings, unless the bride decides to bring her groom along – probably a reference to the old superstition about a groom not being allowed to see a bride in her wedding dress until the big day. Tuxedo Mask’s Quick Change (pp. 181-182): On page 181, Mamoru’s wearing his school uniform, then all the sudden on the next page (182) he’s Tuxedo Mask. How’d he change clothes so fast? Does he wear his tuxedo under his school uniform, or did he stop by his apartment on the way to Usagi’s house and change clothes? (The last panel on 181 suggests the former, as it shows Mamoru taking off his glasses and loosening his tie – perhaps something similar to how Minako is often shown in her “Crescent Moon Power Transform” pose on the last panel of a page in the Codename Sailor V manga, with her transformed self in the first panel of the next page). Bad Translator Note Grammar (p. 238): There’s a slight writing error in the translation note for “Lupin.” It probably should be written “Most likely, she’s referring to the manga hit by the artist Monkey Punch, Lupin III, but it’s possible she is referring to the original French novels about a dashing thief in turn-of-the-20th-century France, from which Monkey Punch drew his inspiration.” That just makes more sense as a sentence. Also, the translator fails to mention the actual name of the original thief from the novels, Arsène Lupin, even though I’m pretty sure I’ve always seen that name mentioned in other explanations of the origins of Lupin III. I do find this note a little odd period, since they suggest there is a possibility Usagi has read the original novels, though I seriously doubt a school underachiever like Usagi would ever read classic novels like the Arsène Lupin novels. (Ami might, though). It’s much more likely she’s read Lupin III (being the manga nut she is) and knew about Lupin from that. Credits: The lines from the Mixx English translation come from scans I obtained at Neo Nobility. The examples given from Miss Dream’s translation belong, naturally, to Miss Dream. Mixx English manga (Sailor Moon) © 1996-1998 Mixx/TokyoPop. Kodansha English manga (Pretty Guardian Sailor Moon) © 2011 Kodansha USA, Kodansha Comics and William Flanagan. Bishoujo Senshi Sailor Moon (Japanese) © 1992-1997, 2003-2004 Naoko Takeuchi. I wanted to point out one more mistake on the page 59 where Ami says: “The only thing I’m good for is studying. I want to become a doctor like Mom, so I have to work hard.” Shouldn’t be here: ” The only thing I’m good AT is studying…”? You’re right, it should be “The only thing I’m good at is studying.” Good catch! “The only thing I’m good for is studying” isn’t technically incorrect gramatically, it’s just maybe not the right phrase for this situation. I might have an explination for the “drunk Usagi” part. She may have thought the drink was just regular juice, but it might have turned out to be some fancy alchohalic drink, which she probably had no idea of. You see the manga note was just explaning what she ment by juice, but it never said that that’s all she drank was juice. It was her first time a fancy ball, and she probably had no idea about it. That makes sense doesn’t it? That’s true. It is highly possible that she drank some alcohol by mistake. Usagi is the sort of person who would do something like that. Guess you already know it, but I recently bought a copy of the first volume of Sailor Moon + Sailor V (Kodansha), and some mistakes had been corrected! (Motoki is always reffered to as “Onii-San”, and brooch is spelled correctly.) ^^ Do you think they might have noticed their mistakes thanks to comparisons like this one? I have heard that they are releasing a new version with corrections, but I have yet to find one in my area to buy and compare. I hope they are fixing the mistakes because of the fans, but whatever their reason I’m happy to see the fixes being made. 1) “Bro” changed to “Onii-san”. 2) “Broach” changed to “brooch”. 3) Sailor Moon’s “Beauty and Justice” changed back to “Love and Justice”. 4) Princess-sama fixed and now just says “princess”. It looks like a third person just went through and corrected the main things people complained about. The newest volumes are much better so I’m hoping that by the time we get to volume 12 that Kodansha realises that the difference in quality is so great that they have to fix books 1-4 at the very least. Yep I do. I got mine through the bookdespository.com website. Looking forward to the error report for volume 6 although obviously reading it is a bittersweet moment. Could I possibly get some scanned pictures of 1st English printings mistakes (e.g. beauty and justice, princess-sama, bro and broach) because I’m doing a comparison video with tokyopop and only have the second printing. That would be great. And yeah I think it was William Flanlang who said every printing the errors get corrected. Sorry to ask but why isn’t the volume 2 of Sailor Moon by Kodansha compared in your website? Is it perfectly or something or I haven’t been able to find it? All you need to do is go to this page’s parent ( https://missdream.org/editorials/ ) to see the full listings.